Memorial Definitions That You NEED TO KNOW! When looking to purchase a monument, it is important to know the definition of several words that will be thrown around by the monument dealer. Of course, you could always ask the dealer to explain exactly what he is referring to when he says something you don’t understand. However, purchasing a monument can be like purchasing a car in that the more you appear to know about the product, the more likely the dealer will be to negotiate prices with you. So, before you call or visit a monument dealer, review the definitions below! If you would like to view images and examples of each of the definitions, feel free to visit our website: www.mikeslaseretching.com. Angel Headstone: An upright monument that is either carved into the shape of an angel, or hand etched with an image of an angel. Apex Top: The top of the die sloping upwards to a point from all four sides. Base: Granite stone that forms part of a monument. The base sits on top of the foundation and supports the DIE. Bevel: A slanting top or edge at a 45° angle. Bevel Marker: Bevel Markers (also referred to as slant markers, hickey markers, or pillow markers) are designed to sit above the ground when installed. They are slanted from the back to the front to allow water to run off the marker and help them stay cleaner than a flush marker. 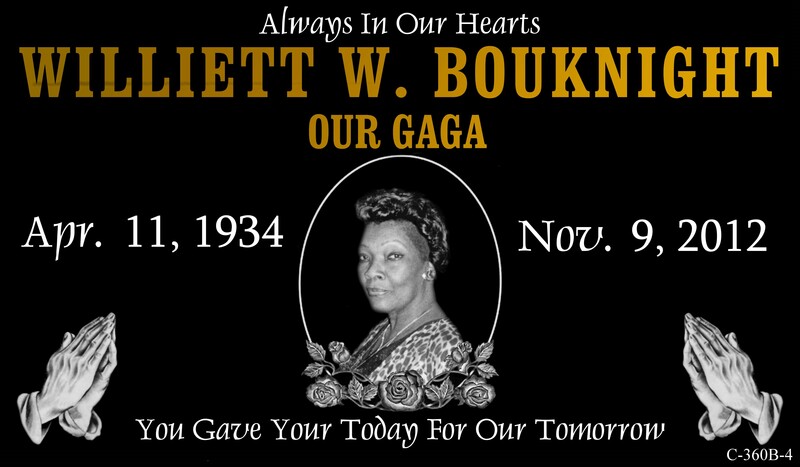 Bronze Marker: A memorial which is cast out of bronze. 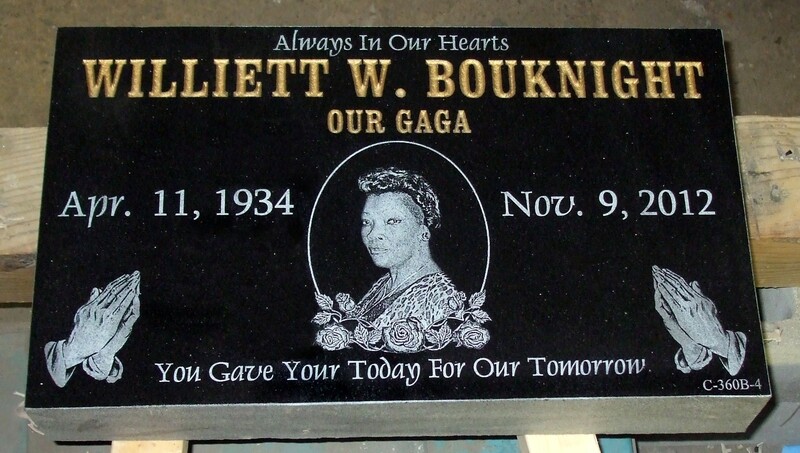 Bronze markers are mounted to granite or cement bases. Columbarium: A building or structure constructed within a cemetery to hold cremated remains within Niches. Companion Upright: A companion upright is usually used for a double plot and consists of 2 pieces. Sizes vary. These are also referred to as companion monuments, companion headstones, companion tombstones, companion memorials, double headstones, double tombstones, etc. Die: The granite stone that forms part of a monument, and is installed on a base. 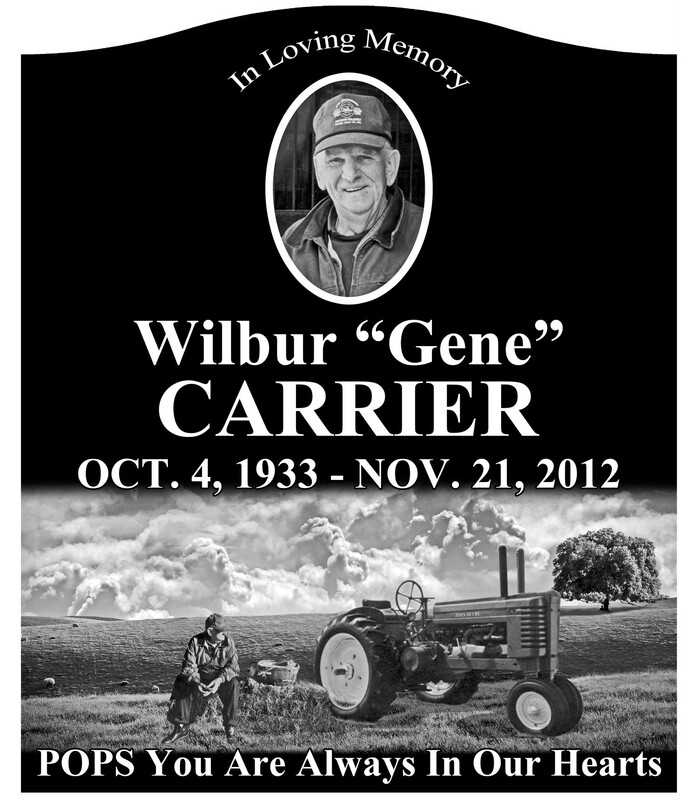 Usually this is where names dates, etc are listed on the headstone. Family Lot / Plot: A lot that consists of two or more adjoining graves, the burial privileges for each individual lot are all held by the same owner. Flush Marker: Granite markers that lay flat with the ground. 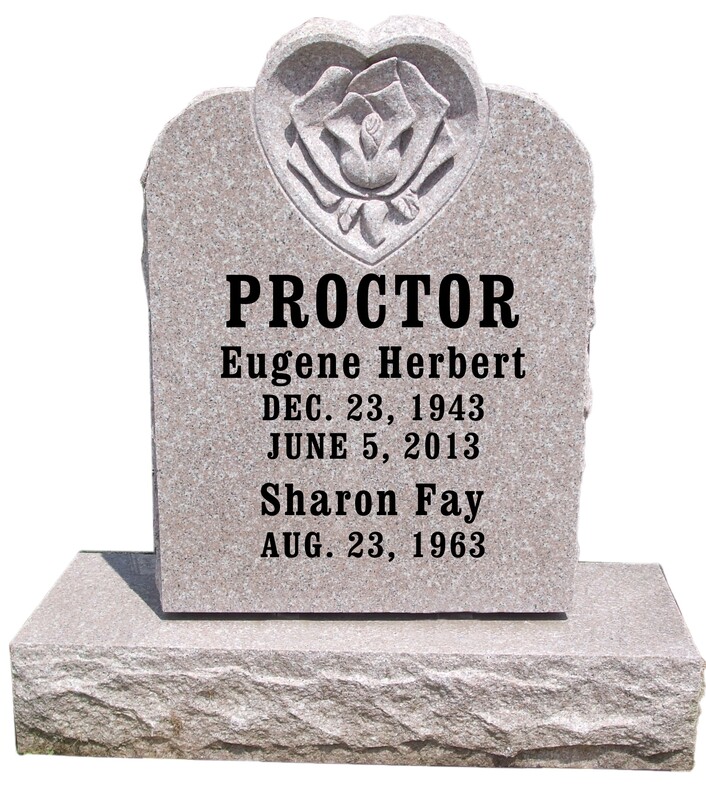 They are generally 24″ x 12″ but can be larger or smaller depending upon individual cemetery or memorial park requirements. Usually 4″ in thickness, different thicknesses do exist and are suitable so long as they fall within the cemetery’s regulations. 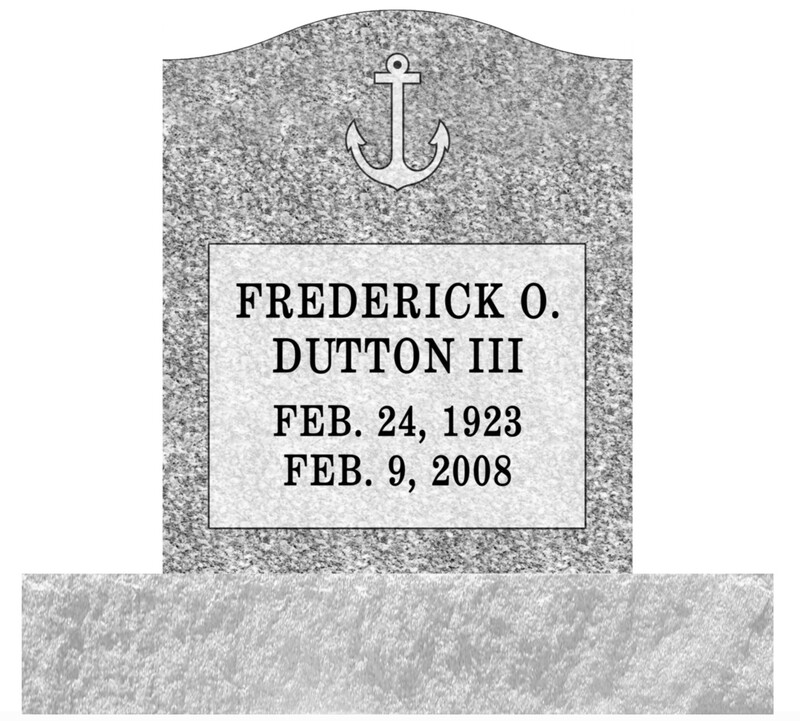 Flush markers are also referred to as flat markers, grave markers, burial markers, and footstones. Foundation / Footer: The concrete footing on which a monument is erected, designed to support the monument. 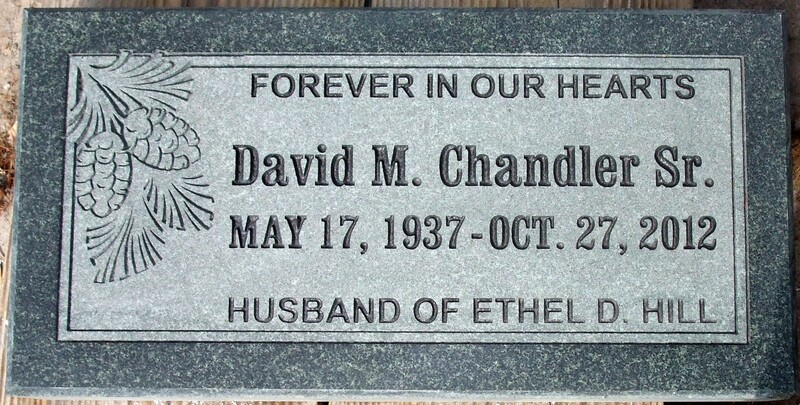 Many cemeteries prefer to set the footer themselves, rather than allowing the monument company to set it. The monument may not be installed until the footer is set and stable. Frost: To lightly remove polished surface of granite by sandblasting. Government Marker / Veteran’s Marker: A flat marker supplied by the U.S. government for the grave of a veteran. Hand Etching: An etching tool with a diamond tip is used to “scratch” the polished surface of the monument. Because this is done by hand, it is not possible to create an image that is the exact duplicate of a picture, as a hand etching cannot be as detailed as a laser etching. Laser Etching: The design which is to be etched onto the monument is loaded into the laser, which will be used rather than a diamond tipped hand tool. Once this is finished, the laser hits the granite with a 8000 degree beam of light in a burst lasting approximately one ten thousandth of a second. The heat of the beam explodes a dot on the surface of the monument, permanently removing the polished surface of the granite. With the size of this dot being so small, an extremely detailed photographed can be duplicated exactly onto the monument using the laser. Ledgers: Memorials that cover an entire grave. Although they are low to the ground, their size allows for extensive decoration and long inscriptions. Mike’s Laser Etching offers ledgers by special order only. Lot / Lots: One or more adjoining graves, crypts, or niches. Mausoleum: A private mausoleum is a granite building with stained glass windows and a bronze door. There are also smaller versions available without doors or windows. 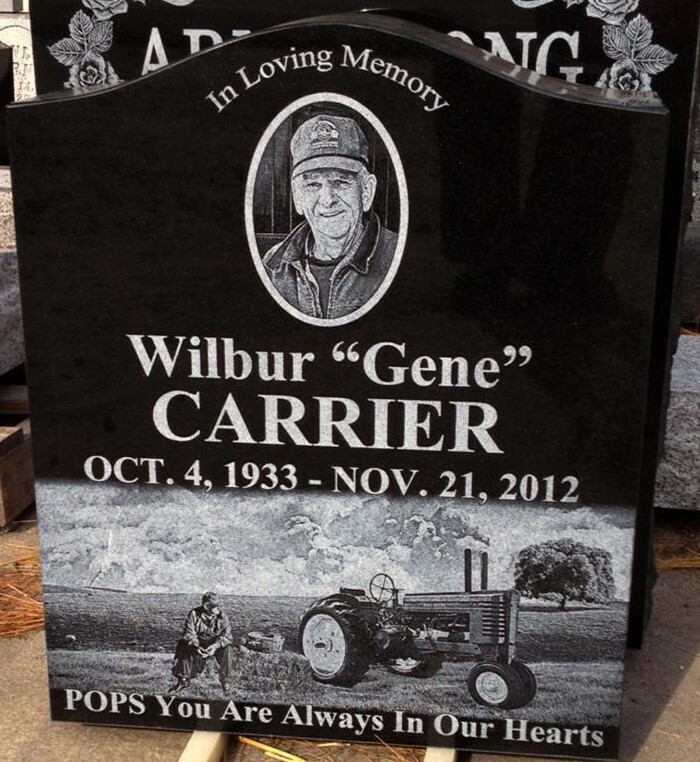 Mike’s Laser Etching offers mausoleums by special order only. Memorial Bench: Granite memorial benches serve as enduring memorials dedicating a park or other suitable location. They can also be used as cemetery memorials. Granite benches are growing in popularity, as they are functional and beautiful. Monument: A memorial that is a flat marker, slant marker, an upright, or a bench. Niche: A space or spaces within a columbarium used, or intended to be used, for the above ground inurnment of cremated remains. Polished Margin: A polished area which is approximately 1” in height, that surrounds a base on all four sides. Polish Number: Referring to number of sides on a DIE that have been polished to a mirrored glass. Polish 1: Front of die polished, back sawn out, sides & top rock pitched. Polish 2: Front & back of die polished, sides & top rock pitched. Polish 3: Front, back, & top of die polished, sides rock pitched. Polish 5: All polished die. Rock Pitch / Rock Face: Way of breaking so the edge of granite has bold projections and depressions, creates a straight line with an irregular facing. Sandblasting: A flat sheet of rubber (a mat) is placed on the granite and the design is then cut out of the rubber. Many companies who own a laser etcher will use the laser to cut out the design on the mat. If they have no access to a laser, this must be done by hand. Fine particles of abrasive are then blown by air pressure against the monument. This abrasive cuts away the granite not protected by the rubber mat. The rubber is then removed, leaving behind a beautiful design on the monument. Finishing touches are then done by hand. Sawn: Granite cut with a saw, straight medium to smoothish surface with duller ink color than the polished surface. Serpentine Top: A reverse curved surface. 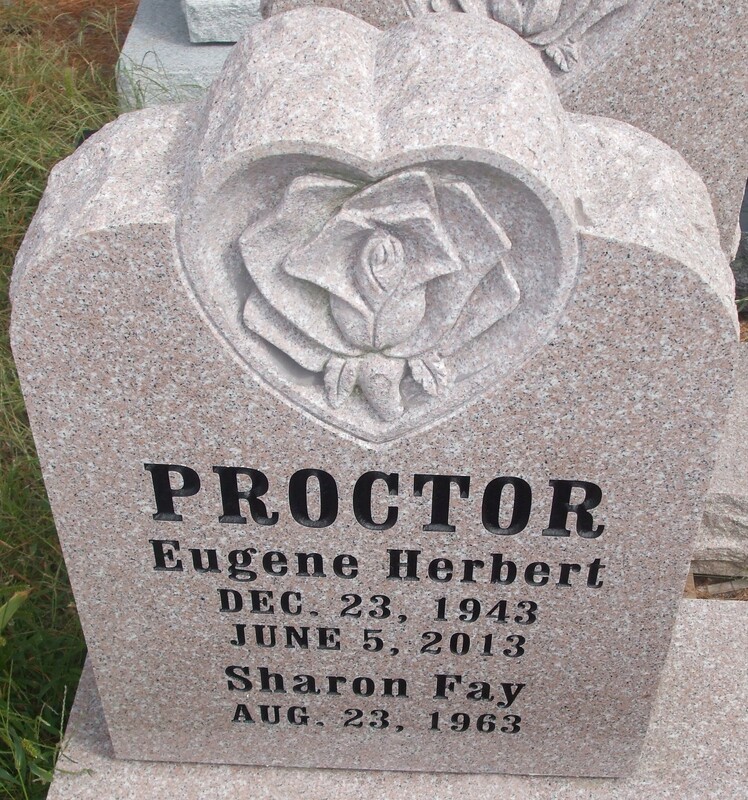 Single Upright: Upright headstones are the most common type of cemetery memorial used today. A single upright is usually used for a single plot and consists of 2 pieces. The top piece is much larger and is called a “die.” The die is typically 24″ tall x 8″ thick x 20″ wide but can be custom made at any size. The bottom piece is known as a “base” and is typically 6″ tall x 12″ thick x 32″ wide. 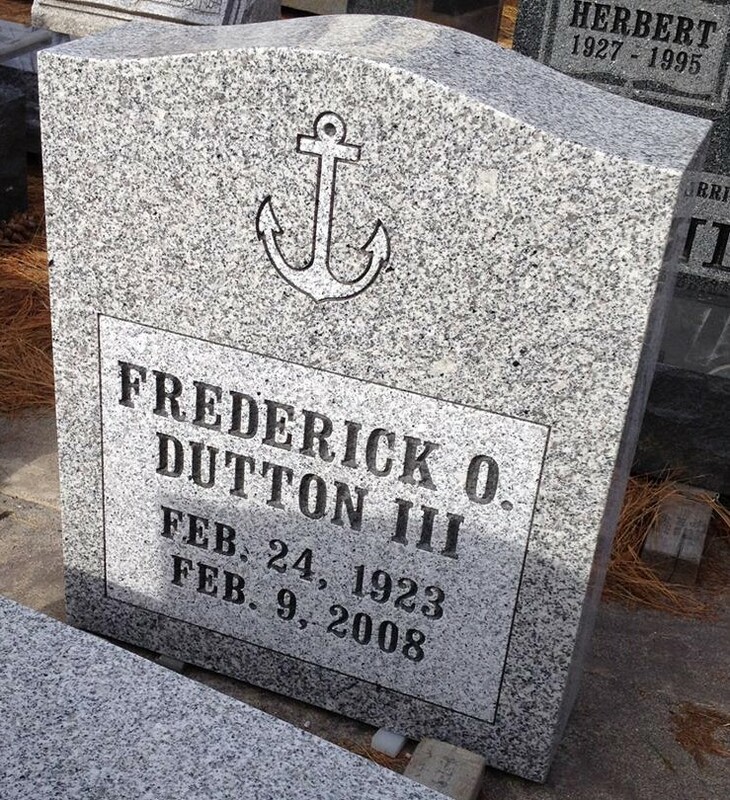 These are also referred to as single tombstones, single headstones, single memorials, single monuments, and single upright grave markers. Slants: Slants typically stand 16″ to 18″ in height with the front slanting or sloping back at a 45 degree angle. These are also referred to as slant headstones, slant gravestones, and slant tombstones. Upright Monument: A monument that consists of a base and an upright die. Question of the Week: How Accurate are the Previews That You Provide To Clients? Does the Finished Stone Actually Look Like the Preview? How accurate are the previews that you provide to clients? Does the finished stone actually look like the preview? We get this question a lot. I think the best way to answer it is to provide a few examples of the preview with a photo of the finished monument.